While bamboo flooring installations have the look, feel, and many of the characteristics of hardwood materials, they are actually made from a type of grass. Bamboo is a perennial evergreen which is also a member of the true grass family. It is grown primarily in southern and eastern Asia where it is an important part of the local economy. Bamboo is a highly renewable natural resource because it is one of the fastest growing plants on earth. Where trees can take twenty to one hundred and twenty years to grow to full maturity, bamboo is a grass, and it can reach its full height in as little as three to five years. It is a relatively hardy and easy to maintain the plant, and it can be harvested without removing the root, which means that it does not have to be replanted each season. The traditional method of making bamboo floors involves slicing the stems of the plant into thin, flat planks. These can be stained a particular color, varnished, or left untreated depending on the desired effect. These strips are then nailed down to wooden beams or larger bamboo pieces to create a support system. Generally, the arrangement of the planks is loose, leaving irregular gaps throughout the floor. The result is a floor that breathes, creating a room that stays cooler and more ventilated in the summer. This is the most common type of Bamboo flooring used in Asia. It is also commonly found in stilted homes. First, the stalks of the bamboo plant are sliced into thin strips so that they can be treated for insects or vermin. Often the material will be boiled or dipped in borax. The material is then shredded into fibers and mixed with an adhesive. The fibers are pressed together into blocks using heat and pressure. Once the blocks are formed the material is cut down into usable plank sizes. It is then thoroughly sanded, and any applicable stain or finish is applied at that point. This type of bamboo flooring is manufactured in a complex process that begins by slicing the stalks of the plants into thin strips of a certain length. The outer skin is removed, and the strips are boiled in boric acid to remove any starches that may be present. The material is then laid out to dry. The natural color of bamboo is a soft, light tan color; however, it can be darkened using a process known as carbonization. This is where the raw material is steamed using a controlled blast of pressure and heat which causes its surface to take on a darker, richer hue. Unfortunately, this process can also reduce the durability and hardness of the bamboo. Whether carbonized or not, the bamboo slices are then kiln dried. The strips of bamboo are then coated with an adhesive resin and are then pressed together either horizontally, with the flat strips laying atop one another, or vertically, with the strips stood on end and pressed together from either side. Whether the strips are laid horizontally or vertically will impact the overall look. This process presses the individual strips together into a solid and durable plank. The bonded strands are then pressed in heat binders to dry the adhesive and join the disparate strands. The raw material is then planed and sanded down into the final planks that will be used as flooring material. A light, UV lacquer is then applied to the planks to assist in the curing process. ​Finally, the planks are sanded to a smooth finish, and any finish that is desired is applied. With engineered bamboo, the stalks are still sliced, treated, and adhered together as is done for solid bamboo flooring. However, after this is complete, the solid planks are then sliced down into thin horizontal layers. These slices are then installed on a backing material such as plywood or fiberboard using heat, pressure, and adhesive. Unfortunately, the urea-formaldehyde adhesive used in the process of adhering the bamboo fibers or strips together emits volatile organic compounds, known as VOCs, which can be harmful to the quality of the air in an interior space. The amount of adhesive used, and its toxic effects will vary depending on the manufacturer of the material. In some cases, the VOCs emitted will be less than those found in manufactured carpeting. 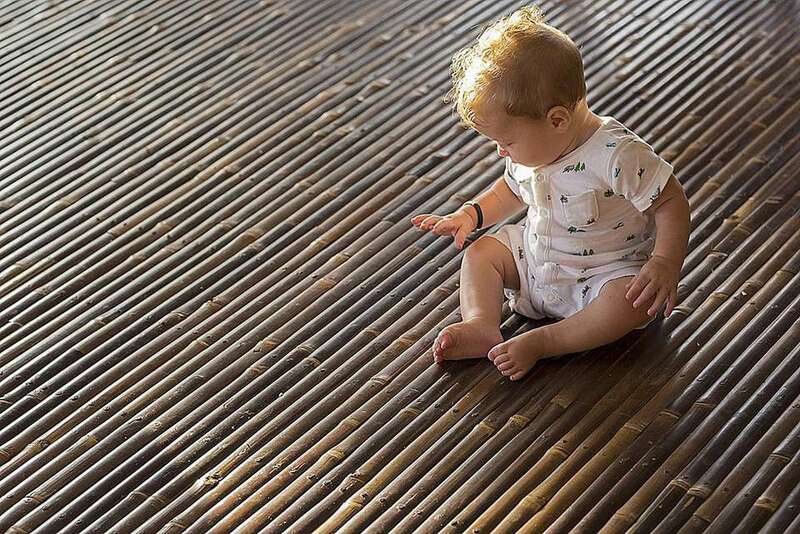 That is why it is so important to find a reputable flooring dealer that is trustworthy so that you can be sure that your bamboo was produced according to the highest environmental standards.